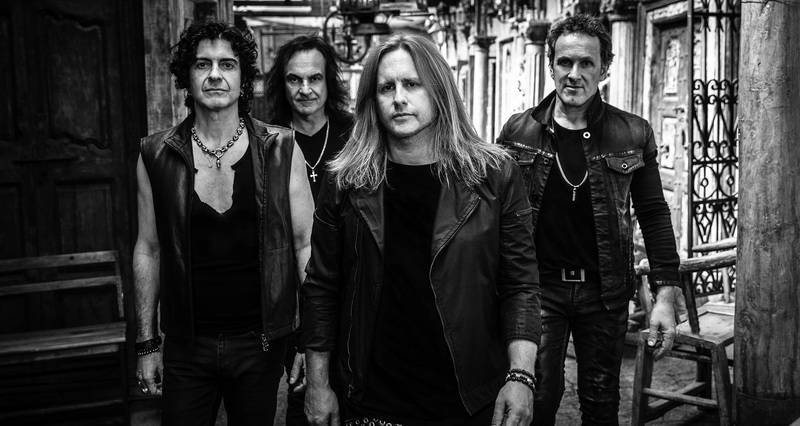 Vivian Campbell, Vinny Appice, Phil Soussan, and Andrew Freeman is collectively known as Last in Line, are set to release their second album,”II” via Frontiers Music Srl on February 22, 2019. The band has announced the impending arrival of their new album with the release of the first video and single, “Landslide.” Watch it HERE. Last In Line was formed in 2011, when Vinny Appice, Jimmy Bain, and Vivian Campbell, (Ronnie James Dio’s co-conspirators and co-writers on the “Holy Diver”, “Last In Line” – the album from which they took their name, and “Sacred Heart” (albums) teamed up with esteemed vocalist Andrew Freeman. The debut album “Heavy Crown” was released in February 2016, landing at #1 on the Billboard Heat-Seekers Chart. Initially, the release had been preceded by tragedy when bassist Jimmy Bain unexpectedly passed away at the age of 68 on January 23, 2016. Last In Line, honoring what they knew would be Bain’s wish to keep the band moving, brought in renowned bassist Phil Soussan (ex-Ozzy Osbourne) and committed to sustained touring in support of the album, hitting festivals, headlining clubs, and sharing the stage with metal luminaries such as Saxon and Megadeth. In late 2017, the band gathered in L.A. to start the recording of the second album, which was produced by the band members and Jeff Pilson (Foreigner, The End: machine, ex-Dokken), who also produced the debut album. Having gelled as a band while touring in support of the debut album, the songwriting came readily to the members. They’ve created a record that shows a big progression in sound, while immediately being recognizable as Last In Line thanks to Vinny Appice’s rhythms, thunderous bass from Soussan, amazing vocals from Andrew Freeman, and the roaring guitars of Vivian Campbell. Asked about first single ‘Landslide,’ Vocalist Andrew Freeman says, ” ‘Landslide’ was the first song we wrote for this record. It was really easy to write as all of the parts fell into place quickly. The title ‘Landslide’ is a metaphor relating to the day to day struggles that we all go through as people. Trying to keep on course when dealing with adversity, manipulation through media and leadership. It’s meant to inspire strength and resolve.